A few weeks ago, Arts Catalyst launched the Graveyard of Lost Species, a public monument by artists YoHa (Graham Harwood and Matsuko Yokokoji) and Critical Art Ensemble in partnership with Arts Catalyst. Graveyard of Lost Species is an outcome from an ambitious 3-year collaborative inquiry with people of Leigh-on-Sea and Southend on the Thames Estuary. 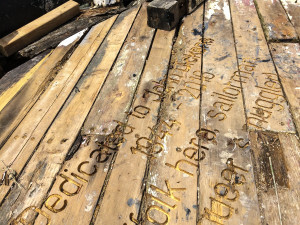 Created from a Thames bawley fishing boat, rescued from the estuary mud by the partners, the names of lost species gathered through research with local people in Leigh-on-Sea and Southend, including fishermen, amateur ecologists, divers, walkers, artists, sailors and others, have been laser cut onto its hull and decks. These lost species include not just wildlife and fauna but also – recognising the inter-connections of ecology, industry, society and culture – traditional industries and occupations that have declined or disappeared, as well as objects, words and phrases associated with these. The artwork is dedicated to the people of Leigh and Southend-on-Sea. The trigger for the collaborative project (its overall title being Wrecked on the Intertidal Zone) was YoHa artist Graham Harwood’s observations of the vast industrial infrastructures being constructed along the Thames estuary, where he lives in Leigh-on-Sea, their impact on local people, traditional industries and the estuary’s ecology, and the lack of local voices in these processes. Traditional marine based industries (such as fishing, cockling and boat building) have for centuries provided employment for communities along the estuary. However, this heritage is rapidly declining. The government and large corporations have devised new schemes for the area, including the London Gateway, the largest deepwater port in the UK, which was under construction when we began the project. Such rapidly changing situations and intense economic interests in the area greatly concern people in local communities, but they feel they have had little or no say. Harwood, Steve Kurtz (Critical Art Ensemble) and I, drawing on their artistic practices and my curatorial interest in developing collaborative inquiries that combine art and citizen science, decided to initiate a new project. We wanted to explore whether, by using art as a critical and investigatory tool and working with a growing group of local people, we might be able to make a difference to how people think about the estuary and how it might survive the pressures that face it. Graveyard of Lost Species (interior). From 2013, we have led a set of enquiries with people in Leigh-on-Sea and Southend to gather local knowledge of and expertise about what is being lost or is disappearing and what changes are taking places in the area. These began with consultation workshop to ask local people what their concerns were in respect to the new wave of industrialisation of the estuary and the impact on local culture and estuarine ecology. Much of the discussion focused on local concerns about the impact of the super port dredging activity on fish stocks, diversity and the cockle beds, and potential impact of the port’s activity on estuary wildlife, including migrating birds. Another area of discussion was the nature reserve of Two Tree Island, where many local people walk their dogs and forage for blackberries, which is built on a former landfill site that has no records of what was dumped there (as there were no regulations in force at the time). Two main strands for our inquiry emerged. One was to uncover and highlight local knowledge about the changing ecology, society and industry of the Thames estuary by collecting stories of lost and declining species, and then to create an appropriate public monument to Leigh’s past and future. Kurtz asks: “How do you make a monument that, rather than creating a smooth ideological space in which all people are expected to feel and believe in the same way, instead accounts for difference and allows for the contradictions and conflict of history, that lets all the different voices speak out? It might be a community but there is not unity of story – there are vastly indifferent interpretations of what’s going on.” The artists’ answer was to create an ‘anti-monument’, one that would come apart, like the memories it marked, over time, and return back into the mud. A second strand of inquiry was to investigate Two Tree Island to try to build up a picture of what might lie under the nature reserve and how toxic it might be, through speaking with people who worked there and by running citizen science workshops, and to develop creative responses to the relationship between people, soil, water and what grows in a polluted environment. Graveyard of Lost Species in situ. Photo: Steve Barnes. During 2014, with little funding confirmed, the team decided to run some public activities and workshops for local people to get things going, raise awareness of the project and attract participants and contributors. We set up an event at Leigh on Sea Marine Festival at which YoHa and Claudia Lastra with artists Andy Freeman and Fran Gallardo invited visitors to “eat, small and taste the Thames estuary”: tasting estuary vapours through e-cigs, smelling distilled oils from local fauna, and eating delicacies made from foraged and prepared foods from Two Tree Island. Alongside this, Freeman presented several proposed citizen science and monitoring initiatives. Following this event, we offered a series of free public exploratory workshops focused on Two Tree Island. These included a mud walk led by local amateur biologist Paul Huxster, studying eelgrass and cordgrass spatial fluctuations across the tidelands, a digital mapping workshop led by Freeman, introducing participants to a range of citizen science tools and techniques, and a wild eating and foraging workshop led by YoHa and Gallardo, guiding participants through the potential hazards of eating wild herbs, plants and fruits on this former landfill site. With some funding secured from Arts Council England and the Wellcome Trust, activities and investigations were able to unfold in a more structured way in 2015. We invited Critical Art Ensemble to the UK for a month-long residency. 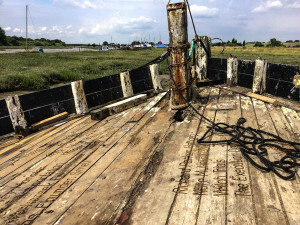 Two local artists – Warren Harper and Stuart Bowditch – joined the team as researchers, conducting research with local people, connecting stories and examples of the ‘species’ that once flourished in the Estuary and are now disappearing. 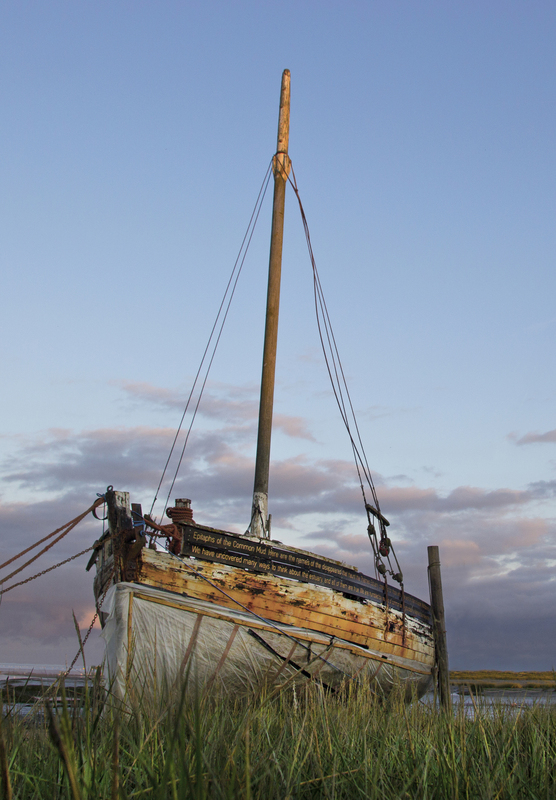 Harwood identified a local wreck – the ‘Souvenir’, a 40ft 12-ton Thames bawley grounded on the estuary mudflats. Over the summer, Harwood and Stuart Mchardy cleaned and reconfigured the boat. They sailed it ashore, siting it for its preparation and engraving in a prominent public setting by the shore on Belton Way, the main thoroughfare between Leigh station and the old town, with a large noticeboard outlining the nature of the project and the monument to lost species. 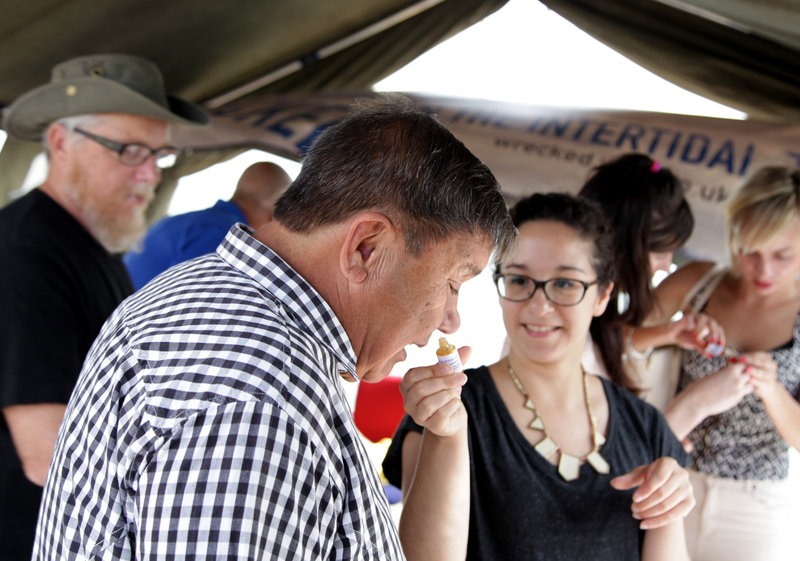 The Souvenir attracted the attention of hundreds of interested passers-by, many of whom stopped to share their memories and stories with the artists and researchers. Gallardo, YoHa, Freeman and Arts Catalyst, supported by the expertise of environmental chemist and food scientist Mark Scrimshaw, led the Two Tree inquiry. We organised a series of public events involving local foods, their source, preparation and consumption, to explore environmental change. Alongside these tastings, citizen science workshops further investigated the traces of waste disposal on Two Tree Island. This intertwining of contemporary art practice, expert scientific knowledge, citizen science techniques and various forms of local situated knowledge has co-produced, and continues to generate, a significant new knowledge archive about the estuary, as well as generating a public conversation around the many changes to the ecology and community of Leigh on Sea. We are collecting the knowledge archive on a website – http://wrecked.artscatalyst.org/, which includes transcripts of interviews, photographs and short films. This collective knowledge is now also taking physical and visual form, giving voice to the contributors and giving back to the community, through the public monument Graveyard to Lost Species and a soon-to-be published ecopolitical book of recipes from the local area, co-authored by Gallardo and Claudia Lastra. As the project moves forward, we are looking at other ways in which local views can be creatively expressed and heard in the governance of the estuary. 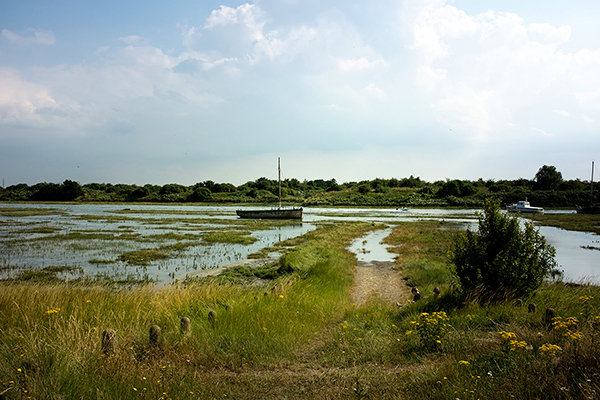 This summer, with planning permission granted from Southend Council and Natural England for its siting and installation, the Graveyard to Lost Species was sailed back onto Leigh Marshes to become part of the local landscape. 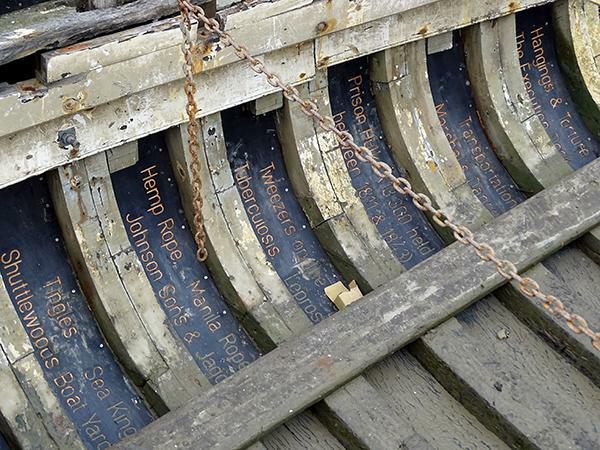 With the names of many lost species carved into the boat’s hull, decks and interior, the artwork is visible to the public from the shore, and publicly accessible by foot at low tide, so that visitors can read the text on and inside the boat. It will gradually decay over many years back into the mud. I hope that you will feel inspired to visit the monument, which is sited a short walk from the road as you enter Two Tree Island coming from Leigh-on-Sea station. Ordnance survey grid reference is TQ 82738 85478. Further outputs, writing and discourse will continue to unfold over the coming year.